Along with the rigors of everyday driving, after hitting the autocross and doing a time trial event with the WR Challenger, we decided it was time to swap out the original transmission fluid for some fresh stuff, and hopefully add some extra protection in the process. While researching what the recommended transmission fluid is for the Challenger’s Tremec TR6060 is, we came across some rather vague information about which type of fluid to use in a synchronized manual gearbox. We discovered that a large contingent of enthusiasts – and even some OEMs – recommend using automatic transmission fluid (ATF) in manual gearboxes, and that got us wondering: In general is this a wise idea? How does it affect performance and transmission longevity? Are there other considerations here? We sat down with Chris Barker, Tech Services Manager at Royal Purple – makers of various types of synthetic fluids for high performance applications – to get the low down. WR: In terms of lubrication requirements, how do manual transmissions and automatics differ? CB: The difference in lubricant function and requirements is significant. 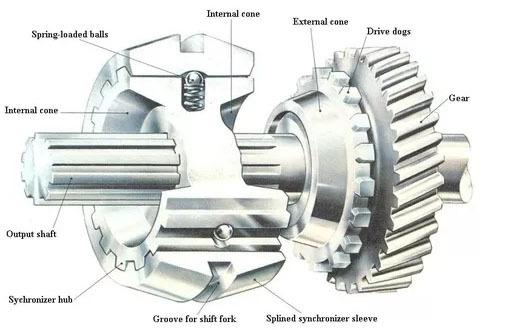 A manual transmission is basically a box some roller bearing and bushings, two gear sets, and a couple of shafts on which the gear sets are mounted. These components need good wear protection and rust protection. An automatic transmission also has roller bearings and bushings, a few gear sets (this time planetary gears), and also several wet friction clutch sets. The automatic transmission fluid must provide not only wear protection and rust protection, but also certain frictional characteristics for the clutches to operate properly and reliably transmit power as a hydraulic fluid. WR: We’ve seen ATF recommended for use in manual gearboxes in certain applications. In general, is this a good alternative to fluid formulated specifically for manual transmissions? CB: ATF is commonly specified for use in manual transmissions and transfer cases for 4wd and AWD vehicles. The reason is that a light viscosity fluid is desired for less drag, and that the ATF provides the necessary wear protection and rust protection for the gears, bearings, chains and sprockets (t-cases), and clutches (t-cases) in these components. Manual transmissions and transfer cases rarely require the extreme pressure capability of heavier GL-4 and GL-5 gear oils. WR: How do lubricants like RP MAX ATF and RP Synchromax differ from one another and what would be the benefits of using Synchromax in a manual gearbox versus ATF? CB: Max ATF and Synchromax are very similar in viscosity and base formulation. However, the Synchromax additive package is tailored more to protecting the bearings, gears and chain and sprocket sets, with little regard to the frictional requirements of an automatic transmission clutch set. In manual transmissions and transfer cases that specify the use of ATF or other light viscosity lubricant, Max ATF works well and is typically superior to the OEM fluid, but Synchromax is better yet than Max ATF for these components. Although we can’t speak for its performance versus Royal Purple’s ATF offering, we can say that shifter operation in the Challenger is noticeably smoother after making the switch from the OEM fluid to Royal Purple’s Synchromax. Click here to shop for high performance fluids in the Winding Road Racing store.